A RARE OPPORTUNITY IN MILTON. 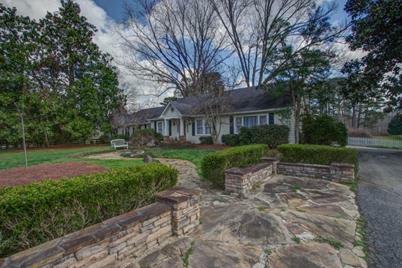 An estate property less than 2 miles from the Windward Parkway exit of GA 400. This is the ORIGINAL farmhouse with the remaining 7.81+/- ac. There is a functional barn w/3 stalls and a tack room, a smaller stable w/3 additional stalls and separate office or storage bldg just behind the house. For the horse lovers, there is also a private practice ring as well. The home itself was first remodeled in 1985 and again in 2007-2008. Although it has all the needed and expected upgrades, it has the original heart of pine floors and overhead beams. Driving Directions: GA 400 North to Exit 11, Windward Parkway, turn left onto Windward Parkway, after you cross Hwy 9, there is an intersection with a light and Windward Parkway will become Cogburn Rd, home is on the right. 13285 Cogburn Road, Alpharetta, GA 30004 (MLS# 6510920) is a Single Family property with a lot size of 7.8100 acres. 13285 Cogburn Road is currently listed for $1,549,000 and was received on February 26, 2019. Want to learn more about 13285 Cogburn Road? Do you have questions about finding other Single Family real estate for sale in Alpharetta? You can browse all Alpharetta real estate or contact a Coldwell Banker agent to request more information.